I finally bought a laminator. I went ahead and got the A3 size (297 x 420 mm	or 11.7 x 16.5 in) so I can make laminated book covers for my handmade books. However I found another use for it as well. I.D. laminator pockets are A7 size (74 x 105 mm or 2.9 x 4.1 in) and fits my playing card size Combat Maneuver cards perfectly. The biggest problem I’ve had with them is they don’t slide like normal playing cards. Well now they do and they are protected from spills as well! Now to spend most of a day laminating enough for all eight players! 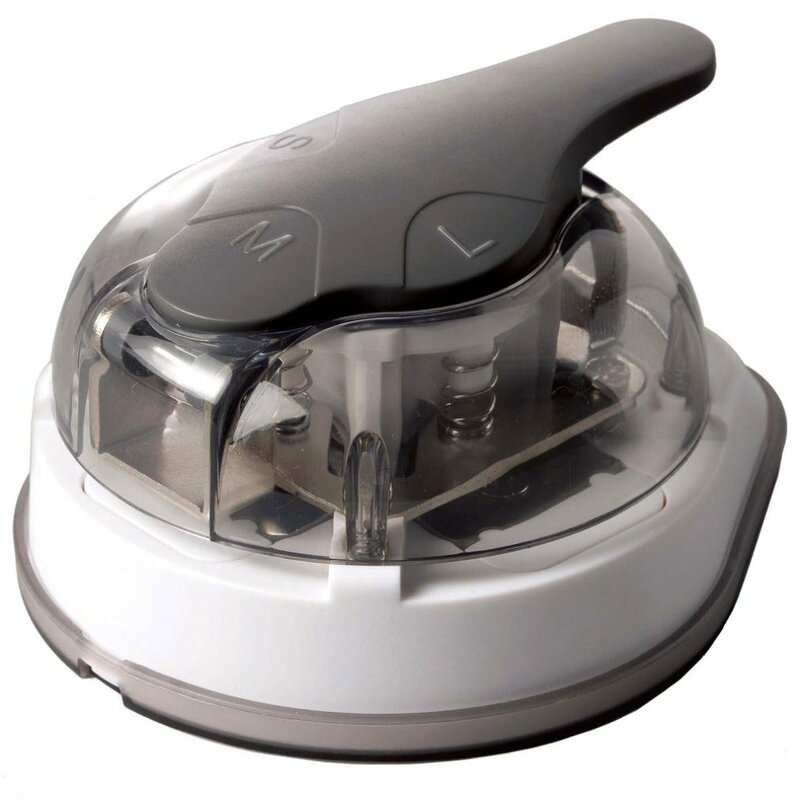 I’ve also ordered a corner rounder so I can trim off the excess plastic so they fit in card cases. You can now save your progress as a pdf! In all previous versions there was no option to save your progress unless you had some kind of pdf printer software to print as pdf. However as long as you have the latest Adobe Acrobat Reader DC (the only thing I’ve tested it with) you can now save the progress and come back to it later. After finally getting the Maneuver Cards done after about five years of working on them off and on I decided to get moving to the Spell Cards. Like the other cards they are a form that you can fill and print yourself. However since there are so many varieties of spells and what they are capable of doing I only made the Page field permanent. The rest of the cells can be entered by the user. 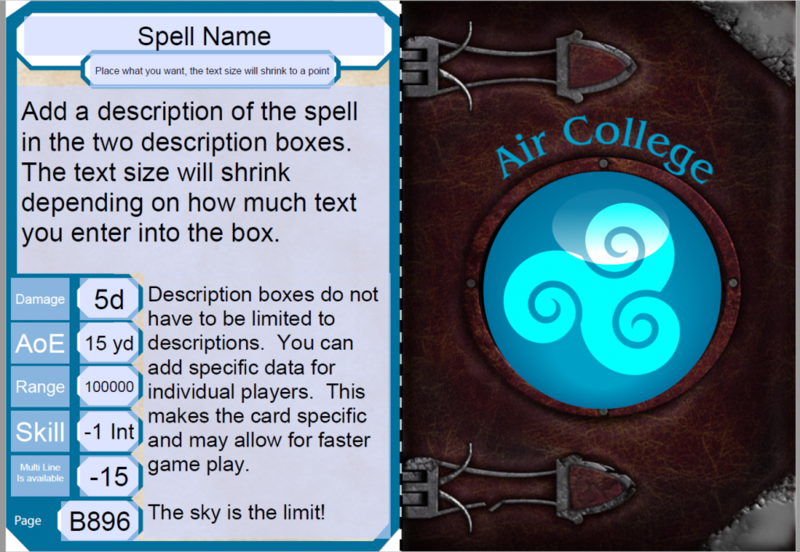 The information panel looks just like the other cards but for the cover I opted for a spell book cover with each College having the same colour represented in GURPS Magic. I also added a symbol for each college. If you end up using them please send me pictures of your cards! 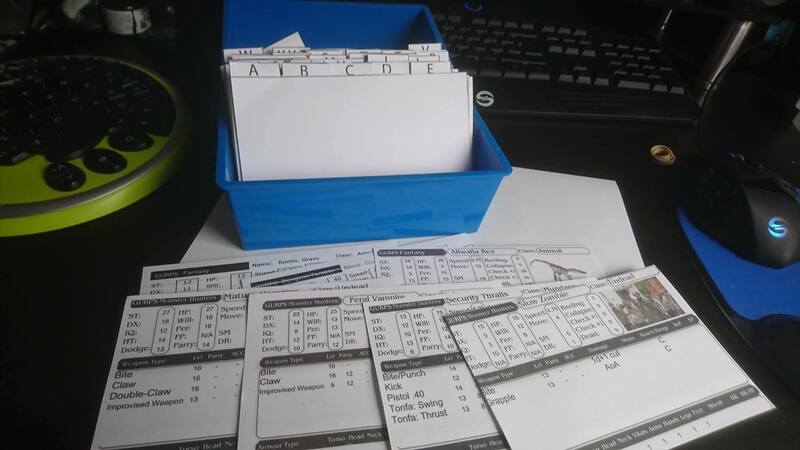 I’ve finally finished the bulk of the cards needed for use during GURPS combat. This has been an on again/off again project since 2012. 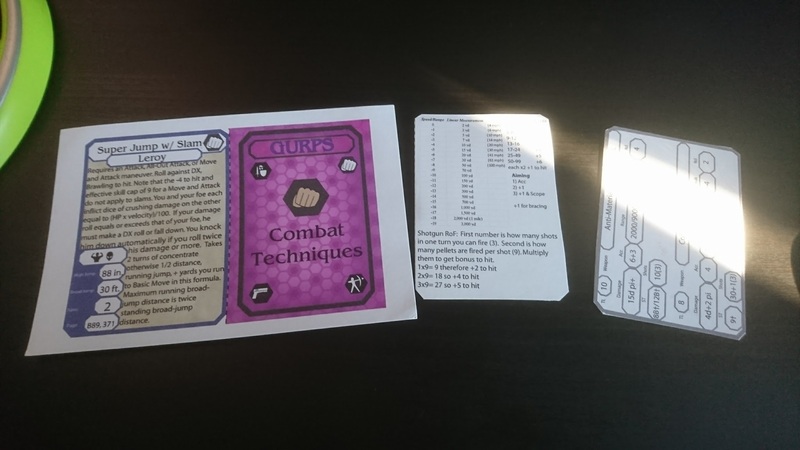 The idea comes from the GURPS Combat cards that you can download for free from Warehouse 23. It is a great idea and very useful but I didn’t like the basic design of the cards or the limited amount of information. 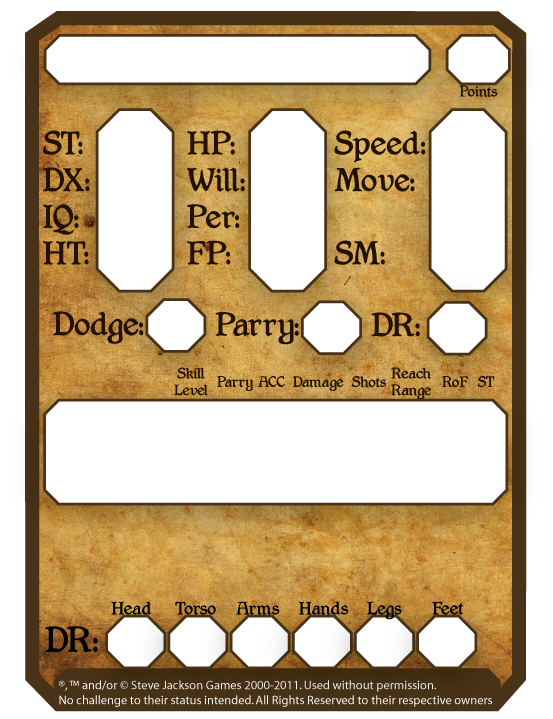 So I came up with my own version which you can enter your own text then print out for use during game play. These are great for beginner or pro and if you use miniatures or counters with a hex map it turns the combat into a tactical table top war game. 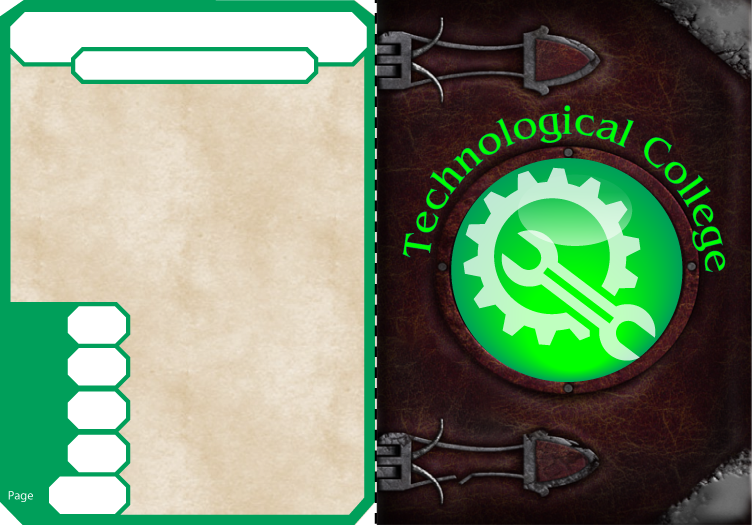 I’ve considered making a play mat to place the cards on, much like you see with Collectable Card Games (CCG). As you can see from the photos above the cards are printed individually on 6×4 blank note cards. Each pdf has three different variants of the card and are a form which you fill out yourself. Once you have entered the information that you desire to have just print it out on the note card, score (crease) down the centre, glue & fold, press with a heavy object so it dries flat, then just cut the remaining card edge. I recommend a hobby knife rather than a scissors. Two other pdf forms are in the folder, both are used for NPC’s and Monsters. One is playing card size like the Maneuver Cards but you print it on an A4/U.S. Letter size sheet of card stock. The other is also a 6×4 note card size which you can fill out and store in a standard recipe box. There is a small area where you can upload a picture unto the card as well. Playing card size version of the Monster Card. Enjoy! Let me know if you use them, send me links to pictures of your cards! Any suggestions? Ideas for different play aids? So I’m kind of handy and creative at sporadic moments. I’m making a 32 page Dungeon Fantasy Campaign Book, A5, to help me whip up my games. I’m a BIG fan of layered pdf’s and fillable forms in pdf so you will be able to do all of that with it. I will also offer it for free to everyone as I have a thing about making money off hobby stuff (stops being a hobby). Page 1: Cover, you can insert your own images, Title, Campaign Segment Number. Page 7: Encounter Sheet. A place to list the encounters and maybe some tick boxes to use for HP/FP tracking. Page 32 Back cover, maybe some game aides. The colour can be switched off to just black and white. The NPC/Monster and PC overview is just going to be Attributes, a few lines for skill/power so only the most used or important. Armor and a few weapons. Very basic but enough to allow the GM to keep tabs on things without having to scroll through a full sheet. 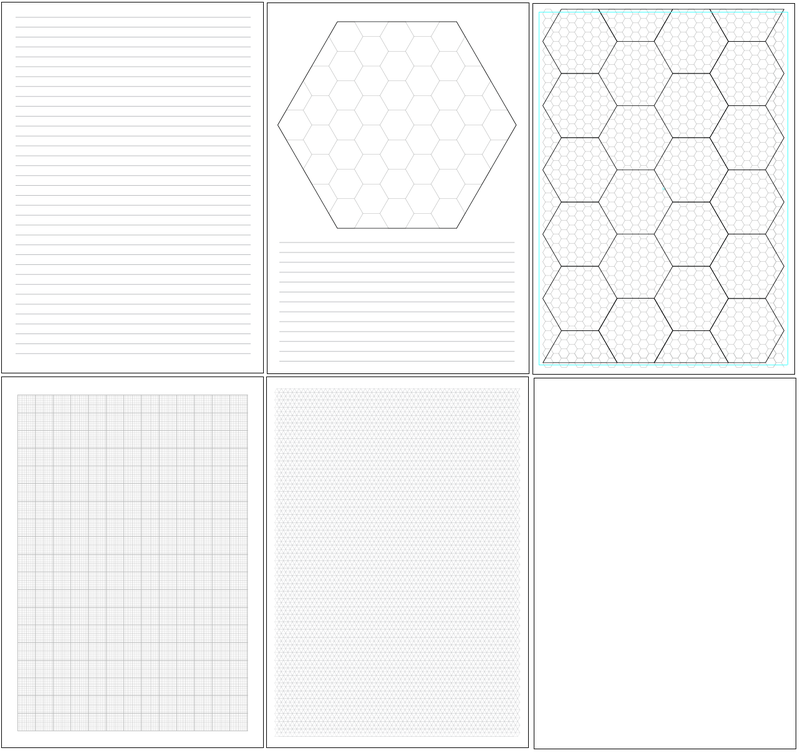 left to right Lined Paper, Geomorph Tile, Geomorph Map, Square Graph, Isometric Graph, Blank for inserting image. The half page option is much the same as above but only offers the top half for the graph and bottom half for writing. I’ll keep posting as I make progress. I just finished two types of fillable pdf cards that you can use for your GURPS tactical combat games. These should be printed on 6×4 index cards, cut, folded and glued. Many more to come if you like these! So here is my version of the GURPS 4e Combat Cards which I Call Maneuver Cards. 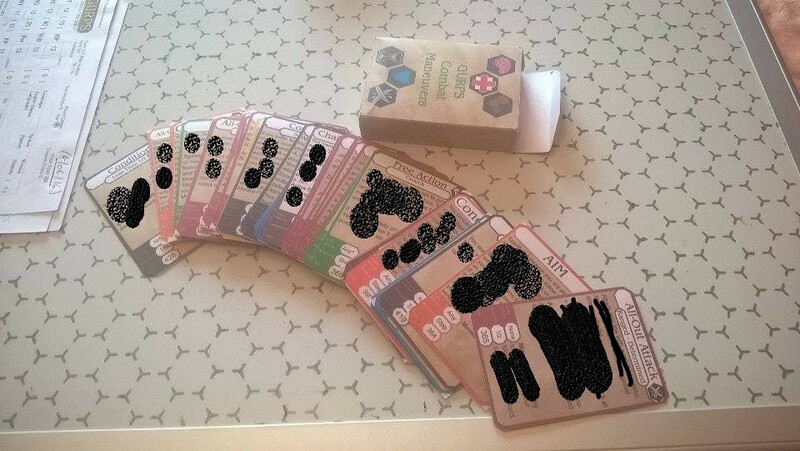 I will be offering Blank Maneuver Cards in pdf Form so you can make your own. I’ve created a form based PDF for monsters and NPC’s to make on playing cards. Just fill, print, cut, glue and fold and you will have yourself a collection of Monsters at your disposal in no time at all! I’ve also made them with workable dials for Hit Points and Fatigue Points and I will have a formatted version up soon with instructions (I hope). I’ve redesigned the cards to Bridge Size (2.25×3.5 inches (56×87 mm)) and I have ordered 200 blank Bridge cards to use in my printer. I’ve asked the GURPS community on Google+ to make any suggestions and to add any Maneuvers not covered in the current GURPS Combat Cards. I’m still working on the Monster cards and I’m unsure if to actually use them or stick with 4×6 note cards.